Ice Arena Mold Contamination by Todd Bradley C.E.M. Mold or "Toxic Mold Syndrome" is a hot topic today. Cases of black mold or toxic mold are reported frequently in many public newspapers and in industry trade journals. Since ice arena's can be an ideal source for growth of molds that are hazardous to some individuals. Managers and operators need to learn as much about this new, evolving problem as they can. The purpose of this article is to acquaint them with the basics of the problem and the terms, conditions and challenges in treating mold areas. Typical Ice arenas operate between 50 and 65°F. As nature warms and humidifies the outdoors, indoor relative humidity can rise. High relative humidity promotes some types of mold growth. Roof or piping leaks or normal operation of showers in lockers room all can add moisture to buildings. If these high humidity conditions are not removed mold contamination can result. Mold spores exist in the air as a normal part of nature. They can be found in all indoor and outdoor environments. The atmospheric mold spore is generally dormant until they find a receptive area for growth. As mold spores find this area, they grow into "Mold" and release more spores and mycotoxins. These mycotoxins and additional spores can cause allergic reactions in some individuals. California has passed legislation requiring testing of structures to verify the lack of mold contamination. Some insurance company's have now removed general liability coverage for mold remediation; separate policies have to be purchased for "Mold" coverage. There is much confusion over what is mold contamination.. Currently there are no standards for mold concentration and there is little information available to determine which molds are "toxic" and at what levels. While the issue has been publicized as the next "Asbestos" remediation opportunity, experts agree that mold does not rise to this level of concern. The reality is, mold is present in our environment and some people seem to be more sensitive than others to specific concentrations of mold. 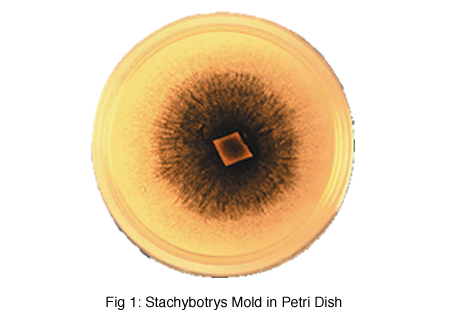 Stachybotrys or "Black Mold" has been identified has a source of allergic reaction. Other molds types are being investigated. Penicillium, Aspergillus, Alternaria, Epiccocum, Cladosporium, and Chaetium are all molds under investigation. Each mold is promoted by different nutrient source material and may cause some allergic reactions to some individuals. Moisture tends to be the key controllable factor in the active growth of mold spores. Low relative humidity or dehumidification will reduce or eliminate the start of mold formations. By maintaining a dry environment the molds spores will not have a key critical component needed for growth. It is important to note that once the mold is established it will create its own moisture source and can be self supporting. Drying the environment before remediation has been complete can disburse more spores in search of the components needed for growth. Uncertainty and fear are currently driving the market to identify hazardous molds and concentration levels to establish guidelines for specific health risks. 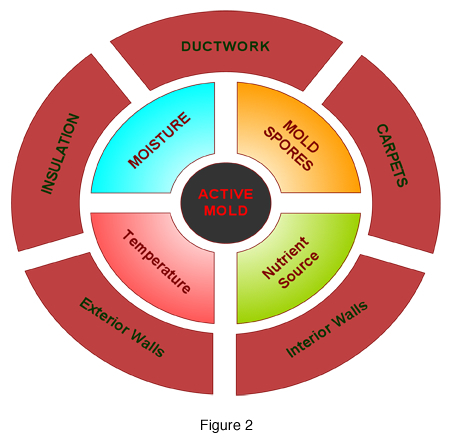 Mold Growth is facilitated by 4 Primary Factors. Growth of molds can be found in exterior and interior walls, insulation, ductwork and carpets (See Figure 2 outer ring). The requirements for active growth of spores; temperature, moisture, a nutrient source and the presences of mold spores as shown in Figure 2-inner circle help the breeding of mold. Once the mold is established remediation is required. Mold can form in any area impacted with high humidity. Water leaks, floods or improper humidity control of the interior areas can result in mold growth. Generally, any porous surface such as insulation, ceiling tiles or drywall requires removal by a trained technician and proper disposal and replacement. Once the mold is established it is virtually impossible to eradicate. Below are some photos mold contamination in wall systems. With virtually every surface a nutrient source, the most controllable factor is humidity. The level of humidity control which is effective varies with the type of spores present. The ASHRAE recommended target control level is 40 to 60% RH. Most recreational ice arenas do not actively control temperature. The ambient temperature follows the radiant cooling effect of the ice sheet. Temperatures between 40° and 65°F are normal internal temperatures. Because the ice arena is cool, this is a unique challenge for humidity control. For the past 10 to 12 years most state-of-the-art arenas have incorporated desiccant dehumidification to prevent fog and condensation in the cool environment. By controlling humidity it improved the efficiency of the ice plant and eliminated condensation. Still another benefit was noted, the reduction of odors generally related to musty or moldy conditions. The recommended control levels to optimize ice arena operations is 40% relative humidity at 55°F. This humidity level has helped the indoor air quality by limiting mold growth in most parts of the arena. Understanding the building and wall structure is still important as high relative humidity can still reside in enclosed wall spaces or improperly placed vapor barriers. Minor leakage from high humidity areas or leaks in vapor barriers can rapidly condense in wall cavities or insulation systems.